To celebrate, the kids of The Covenant House put together a Pride playlist for you to enjoy with us all month long. Featuring artists like Frank Ocean, Lady Gaga and Queen, we hope this playlist fills your ears and your heart with good Pride vibes. Pride Month is all about love, acceptance and celebration. It’s also about recognizing the challenges, and injustices, that the LGBTQ community faces — particularly when it comes to homelessness. Did you know that 40% of youth experiencing homelessness identify as LGBTQ? Some of these kids are forced out of their homes after coming out to their families. Some run away in fear of rejection — and have nowhere to turn. Not only do they need a safe place to stay, they also need non-judgmental support and unconditional love. At The Covenant House, They keep their hearts, their arms and their doors open to LGBTQ youth experiencing homelessness. They encourage kids to be exactly who they are — and we celebrate their uniqueness and individuality. In a world where LGBTQ youth are 120% more likely to experience homelessness, there is a role for all of us to play in creating a more tolerant and accepting environment for these kids. So, check out the playlist on Amazon Music, turn it up and stay tuned for more ways you can support LGBTQ youth experiencing homelessness with us this month. 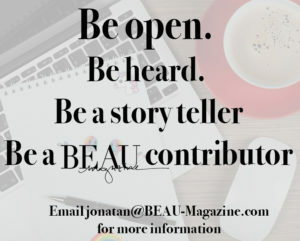 © 2018 BEAU Magazine™ - All Rights Reserved. Terms of Service . Website Design by Sarah Bendorf - Design Debonaire.